Infinity Posture connects, between the upper arms and lower legs, the flow of inner energy which travels through the frontal side of the torso, promoting circulation in the entire body. The energy flows down from the head to the bottom of the feet through the energy channel called Stomach Meridian. From natural stance (Start/End), point your heels outward and bend your knees. 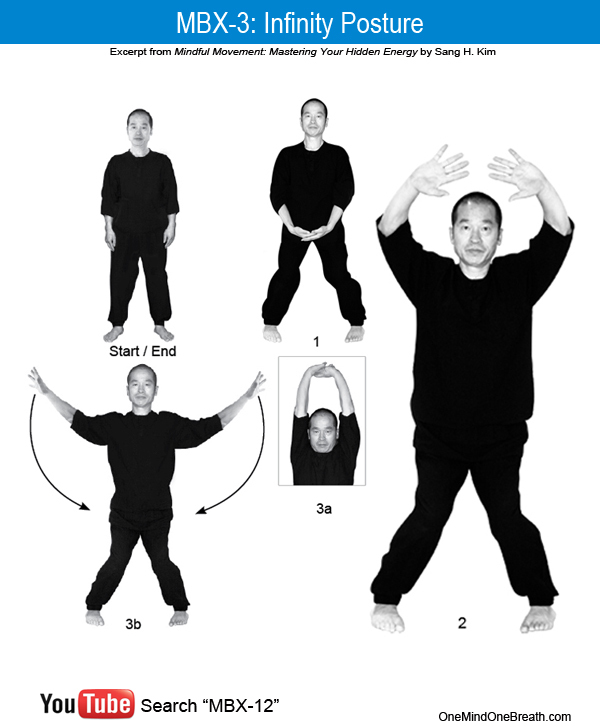 Place your open hands in front of your belly with palms facing upward. Exhale. Inhaling, raise your hands above your head with your fingers wide open. Pause for 3 seconds. Exhaling slowly, bend your knees slightly. In the same position, inhale quickly and deeply; then exhale very slowly. Inhaling as deeply as you can, push your hands upward to maximum extension (3a). Slowly exhale while lowering your hands sideways to your hips (3b). Keep your fingers open wide throughout. End in natural stance. Lower your posture: Infinity posture increases blood flow to the gut area in two ways: by draining blood from the arms and by pushing blood upward from the legs. Increased blood in the stomach boosts digestion and raises energy levels. When you lower your posture, the energy from the bottom your feet rises toward your stomach. Raise your hands above your head: Make sure that you keep your hands at a height that is at least above the head and bend your knees (2). Bring your attention to your heels and hands: Heels out and toes in. For maximum impact, open your fingers as wide as you can. Breathe in through the nose and out through the mouth very slowly. If you feel any pain in your knees, raise your posture to a comfortable level and bring your heels slightly in. If you feel any pain in your back or neck, adjust the angle of the torso and head for your comfort. This entry was posted in MBX Project, MBX12, Mindful Movement and tagged Centering, Energy, How to Boost Energy, Infinity Posture, Invigorate, MBX-3, Meridian, Self-care. Bookmark the permalink.